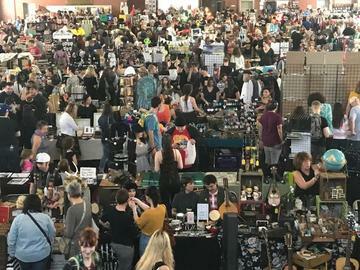 The Punk Rock Flea Market is the place to sell awesome clothing, records, crafts, art, and most of all old punk junk! If you care where your table is, please be sure to choose your location from the map when purchasing tickets. If you do not choose a location ticket leap will automatically asign you one. Each seller may purchase up to 2 tables. Please be sure to choose tables that are next to each other. We will not be able to move your tables for you after your tickets are purchased.